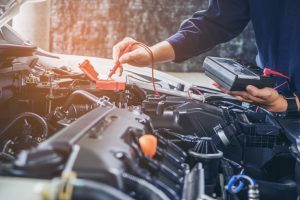 Vehicle hardware problems can be complex, but if your car’s computer is on the fritz, Johnny’s Auto Service is available for car computer programming in Covina. Some auto mechanics offer remote computer programming, necessitating extra appointments to resolve your car’s issues. At Johnny’s Auto Service we’re your one-stop shop for automotive computer reprogramming near me. With modern automotive systems, your car’s computer controls nearly everything, from your car’s security system to its GPS and stereo. A simple programming issue could cause a world of worry. But at Johnny’s, we can not only diagnose a computer issue easily and quickly, but we can repair it onsite, too. Our shop was established in 1970, and our mechanics (most of whom are ASE-certified) have decades of experience between them. Whether you drive a classic car with an updated system or a state-of-the-art new vehicle, we can help you with auto computer reprogramming near me. Though we service all major automotive brands, from Acuras to Volkswagens, you’re not sacrificing depth of knowledge when you visit us. We know that it can be difficult to get an appointment at your car dealership. Rest assured that when you come to our auto repair shop, you’ll get prompt service no matter the brands. With relationships with all major parts retailers and the knowledge to get to the heart of any vehicle problem, we have what it takes to get your foreign or domestic vehicle back on the road. For three consecutive years, we’ve attained a 100% AAA Customer Satisfaction rating. And our customer reviews speak for themselves. Visit us online at johnnysautoservice.com to read more about our dedication to keeping our customers happy. Whether you need car computer programming in Covina or need to complete your last scheduled maintenance, we’re happy to help. Give us a ring at (626) 966-5212 to learn more or to schedule a service with one of our service advisors today.